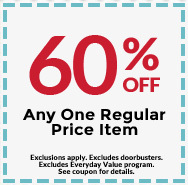 Michaels has released this printable coupon, valid for 60% off ANY one regular priced item! You can either print out this coupon, or present it on your smart phone to save ink. This is valid today (3/29) only. If you use it online, use promo code 60SAVE32917 at checkout. Shipping starts at $6.95, but orders of $49 or more qualify for free shipping. You can also opt for in-store pickup, which starts at $2.95. Some exclusions apply, so be sure to read the fine print.